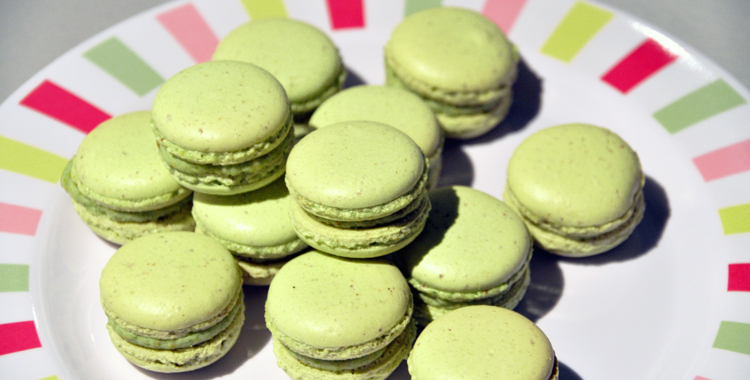 I have posted a recipe for pistachio macarons earlier on this blog. In that recipe (found here) the macarons were filled with a pistachio butter cream. In this recipe on the other hand, I have filled the macarons with a white chocolate ganache to which I have added pistachios. Even easier, not to mention super tasty! Both macarons tastes clearly of pistachio, but these ones with chocolate ganache might be a bit milder with a more round flavor than those with butter cream. Follow the base recipe making the macarons, but use 80 g almonds (instead of 100 g) along with 20 g pistachios. Add green (and yellow) concentrated food coloring to the mixture, while beating the egg whites. Bake and cool the macarons. Grind pistachios in a blender or use a hand grinder if you want. Combine chocolate and heavy cream in a small saucepan. Heat the mixture over low heat until the chocolate has melted. Remove the pan from the heat and add ground pistachios. Mix together and leave to cool. If you think the ganache becomes too brown, you can add some green food coloring to it. When the ganache has thickened (after some time in the fridge), you can start sandwich the macarons. Whip the ganache well. Use a teaspoon, a knife or a piping bag, whichever you prefer: turn a macaron upside down, add 1/2-1 teaspoon of ganache, and press the bottom of another macaron on top of it. Wow, I just love this recipe and blog! I used this Pistachio Macaron recipe for my first ever macarons last weekend and they turned our brilliantly – so thank you! Again love the blog and can’t wait to see what’s next! I would love to enter the challenge, but I thought it was for UK residens only. Can I enter, do you think?